PWD will present plans for green improvements at a Phila. Police Department building, Saunders Park and local streets on Feb. 21. This drawing shows improvements that could come to Pearl Street. At the Philadelphia Water Department, we're always looking for ways to team up with sister departments like Parks and Recreation, Streets, the Dept. of Public Property and non-profits to build new Green City, Clean Waters tools that manage stormwater on public property. The idea is that we can save time and money for the City—and reduce the headaches that can come with construction sites—by building green infrastructure in places where other types of investments are already taking place or needed. Tuesday, February 21 at 5:30 p.m.–8:30 p.m. This presentation will be a part of the monthly 16th Police District Captain's Town Hall meeting. We will cover improvements to the 16th Police District Headquarters at Lancaster Avenue and Spring Garden Street that include creating a new landscaped stormwater planter within a plaza area at the front of the building and retrofitting the Warren Street parking lot located behind the building. 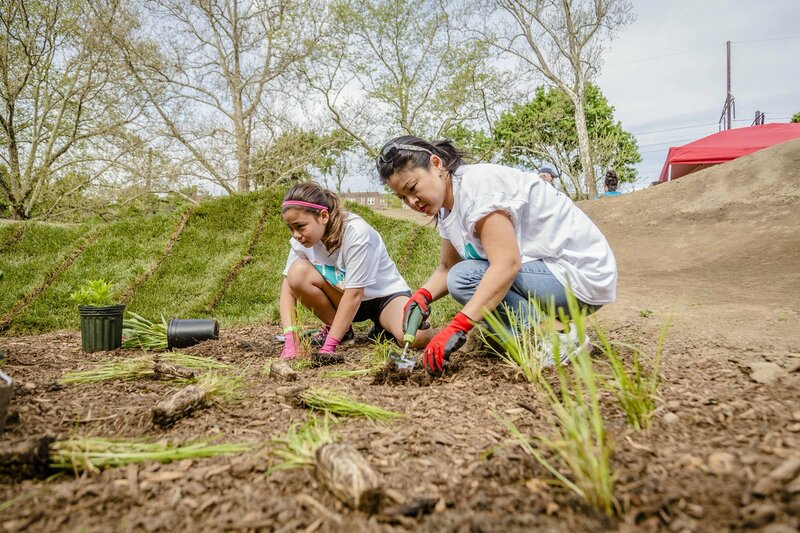 Combined, these green improvements are expected to manage around 136,000 gallons of stormwater during a one-inch storm—an amount that, over a typical year of precipitation, will total up to 8.16 million gallons of polluted runoff kept out of local waterways. For the 16th Police District, these Green City, Clean Waters investments will mean new landscaping with plants and flowers that will make the front of the building a more inviting public space. PWD is also working with two non-profit partners to organize additional improvements. 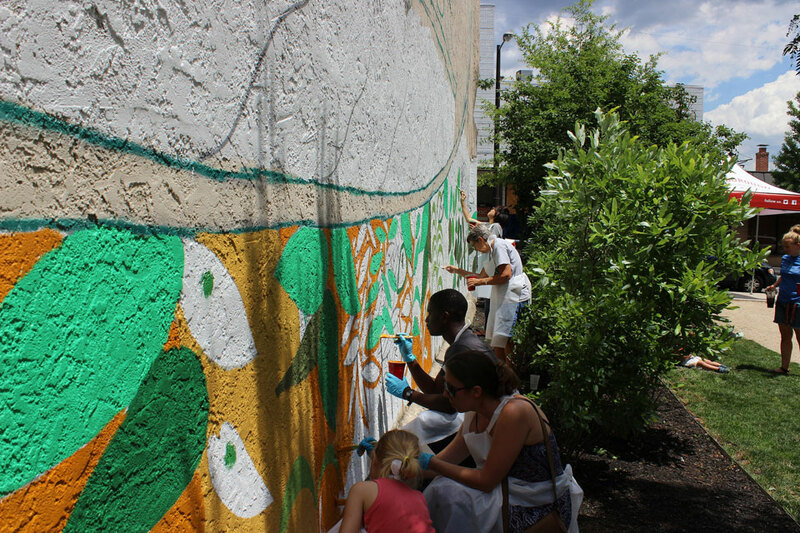 Mural Arts will help bring a mural to the site, and Tiny WPA is hoping to use a grant to build benches or other installations aimed at facilitating community engagement. Additional partners include the Mayor's Office of Community Empowerment and Opportunity and Public Workshop. As a part of adding new stormwater tools to the district headquarters, we're working with the Police Department and Department of Public Property to invest in repaving the Warren Street lot once the water-related upgrades are made. During the February 21 meeting, we'll also cover plans for even more green improvements proposed for the nearby Saunders Park and surrounding streets. Using a variety of green tools—including stormwater tree trenches, stormwater planters, bumpouts, infiltration basins, and green gutters—the proposed improvements will manage an estimated 193,000 gallons of stormwater during a one-inch storm. Over a year of typical Philly weather, those tools could keep close to 11.6 million gallons of polluted water out of local sewers and the Schuylkill River. Amy Liu, a PWD planner who helps to initiate Green City, Clean Waters projects on City-owned properties, says that the 16th Police District proposal is one of a number of projects that could bring improvements to Police and Fire Department facilities across the city. For example, in the Lawncrest neighborhood, plans are already underway to build a new rain garden at the Philadelphia Fire Department's Engine 64 facility as part of a block-wide greening effort, which also includes stormwater improvements at the Lawncrest Library and Lawncrest Recreation Center. Liu says PWD hopes to eventually examine all Police and Fire sites for Green City, Clean Waters investment opportunities, which could lead to dozens of new green stormwater sites and more opportunities for PWD and the Department of Public Property to collectively leverage resources to upgrade these facilities. If you live in the area around Saunders Park and the 16th Police District, please join us at the Captain's Town Hall to get more details about the proposed improvements and give us your feedback.